Aspire Industries and Tae Yang Corporation were the leading names in the global butane gas cartridges market in 2015, Transparency Market Research (TMR) says in a recent market study. The strong product portfolio of both these companies is playing a crucial role in serving the demand of key regions thus having a strong grasp over these regions. Nevertheless, these companies are showing promising growth across the globe. Despite an intensive competitive profile of the global market for butane gas cartridges, the market is favorable for entry of new entrants. This is due to easy availability of inexpensive raw materials and low capital required for entry into this market. Consequently, this will compound the degree of competition within the market, which will be further boosted by the rising rivalry from substitutes for butane gas cartridges. The global market for butane gas cartridges stood at US$364.55 mn in 2015. Expanding at a CAGR of 4.73% between 2016 and 2024, the market is expected to reach a valuation of US$555.24 mn by the end of 2024. The application segments of the global butane gas cartridges market are medical, stoves, pest control and food and beverage, fumigation, and others. The butane gas stoves segment held the leading share accounting for more than 50% of the revenue of the market in 2015. This is mainly due to extensive use of butane gas stoves due to its portability for camping and outdoor use. The food and beverages industry is a major end-user of butane gas cartridges as they are used as a fuel for blow torches for meat and fish processing. The increasing demand for convenience foods is the key factor driving the demand for butane gas cartridges in the food and beverage industry. Butane gas is also used in the medical industry for a number of medical procedures. Furthermore, butane gas cartridges are used as portable energy units in pest control machines, especially in rural areas. 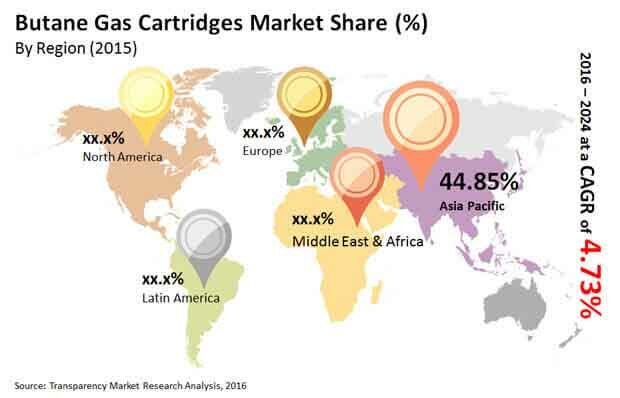 Asia Pacific stood as the leading market for butane gas cartridges in 2015. The high demand for aerosol containers is significantly driving the global market for butane gas cartridges in Asia Pacific. Small-size traders, distributors, vendors, wholesales, and e-stores form the major distribution channel for butane gas cartridges in this region. In Asia Pacific, China is the leading market for butane gas cartridges. The growing population combined with increasing energy storage requirements in China is ramping up growth of the global market for butane gas cartridges. The region is trailed by North America and Europe in terms of revenue contribution to the global market in 2015. “Due to the high dependence of industries on conventional fuels, energy reserves can get exhausted faster than they can be generated,” says TMR analyst. This demands energy security in the long run wherein butane gas cartridges come into play. Industrial as well as individual consumers are exhibiting an increased demand for gas capsules due to their easy portability over other fuel. This is particularly beneficial for fuel requirement of individuals in remote locations. The higher efficiency of butane gas cartridges as compared to other liquid fuels that can be deposited in capsules is also driving the global market for butane gas cartridges. The light weight factor of butane gas cartridges and impressive fuel efficiency for their storage volume add to their demand.